the risk – Speaking aboard the plane returning him to Manila, Mr Aquino told reporters he was well aware of the risk he was taking. “I suppose there’s a physical danger because you know assassination’s part of public service,” he said. “My feeling is we all have to die sometime and if it’s my fate to die by an assassin’s bullet, so be it.” When his plane landed at Manila airport Mr Aquino was taken into custody by soldiers and escorted off the plane. 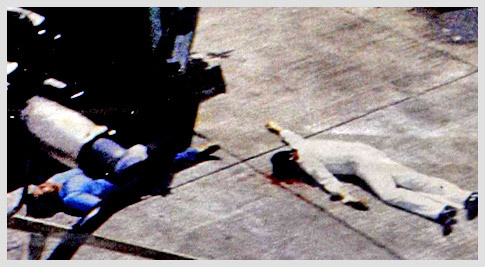 Shortly afterwards witnesses on the plane said a volley of shots rang out and they saw him lying in a pool of blood on the runway tarmac (1983: Filipino opposition leader shot dead). optimism – Ninoy’s optimism was a revelation. For the treatment at the hands of his captors had grown worse after most of us had gone, not better. By march 1973, Ninoy himself recounted it in a letter to “Monsignor” Soc Rodrigo, he was averaging 1,200 Hail Mary’s a day. On March 12, Ninoy was led to a blue Volkswagen Combi and saw Pepe Diokno already seated inside. The two of them were hustled aboard a blue and white helicopter “white a presidential seal,” blindfolded and handcuffed. The chopper took off and landed (as they found out weeks later) in Fort Magsaysay in Laur, Nueva Ecija. “When the blindfold was finally removed,” Ninoy recalled, “I found myself inside a newly painted room, roughly four by five meters with barred windows, the outside of which was boarded with plywood panels.” Only a six-inch gap between the panels provided air and light. A bright neon-tube burned day and night. There were no electric switches, the door room was bare except for a steel bed without mattress. No chairs, tables, nothing. Ninoy was stripped naked, his wedding ring, watch, eye-glasses, shoes, clothes, taken away. A guard brought in a bedpan and said that he would be allowed to go to the bathroom only once daily in the morning to shower, brush his teeth and wash his clothes. He was issued two jockey briefs and two T-shirts and instructed to wash one set everyday. Diokno apparently occupied the adjoining “box” but they were warned not to try to communicate with each other. The cruel part of this punishment (Ninoy was never informed what they were being punished for) was that all his belongings — ring, watch, glasses, were given to his wife, Cory, without explanation. For a horrified period of time, his mother and his brothers and sisters, and Cory and the children, could only despair that Ninoy was dead. Eventually they located him, but they were powerless to do anything. Ninoy and Pepe endured 30 days in their stifling boxes — during the hottest time of the year. It was a transparent attempt to break Aquino’s and Diokno’s will. 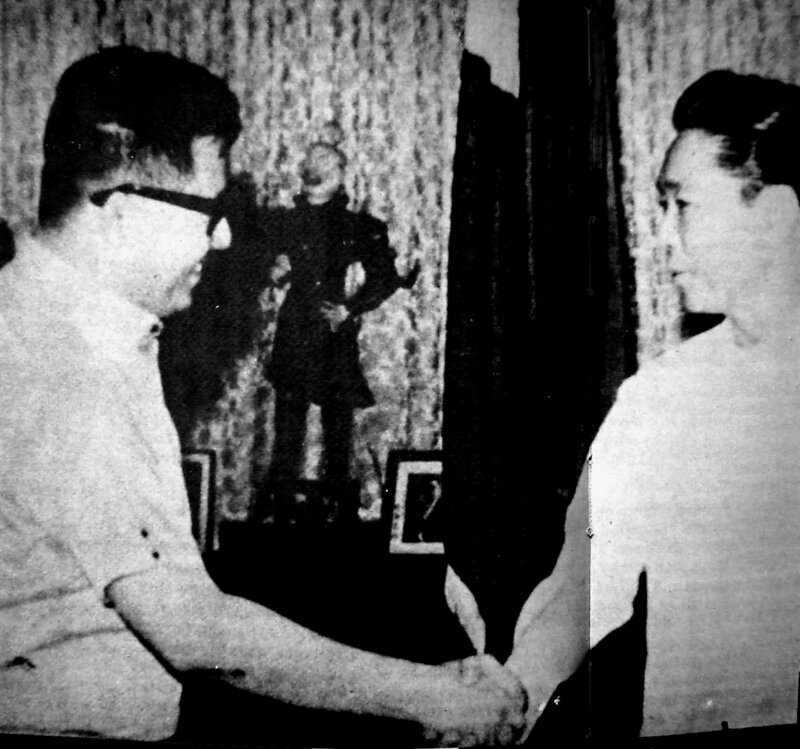 On Aug. 27, 1973, back in Bonifacio, Ninoy was brought before a Military Tribunal, specifically Military Commission No. 2 chaired by Brigadier Gen. Jose G. Syjuco. Ninoy was charged with alleged violations of Republic Act No. 1700, the Anti-Subversion Law, with four separate charges and a total of nine specifications including murder, subversion, illegal possession of firearms. He refused to take part in such a farce of a trial, asserting that military officers should not be allowed to try him since their commander-in-chief, President Marcos, had already declared him “guilty” in his public pronouncements. Moreover, sentence by a military tribunal did not permit him an appeal to the Supreme Court. “I will not participate,” he stated, “You can dispose of my flesh, but I cannot yield to you my spirit and conscience.” Aquino’s defiance led to the suspensions of hearings for a year and a half, but on March 31, 1975, his objections were brushed aside by the tribunal which proceeded, after a few — and starts to “reinvestigate” witnesses against him Huk Commanders Melody, Ligaya and Pusa, Tarlac politician Max Llorente, and others. Ninoy put up no defense for the trial that was launched in 1973 and finally concluded in 1977. He simply expresses his innocence (Ninoy: In The Eye of Memory). undelivered arrival speech – “…According to Gandhi, the WILLING sacrifice of the innocent is the most powerful answer to insolent tyranny that has yet been conceived by God and man. Three years ago when I left for an emergency heart bypass operation, I hoped and prayed that the rights and freedoms of our people would soon be restored, that living conditions would improve and that blood-letting would stop. Rather than move forward, we have moved backward. The killings have increased, the economy has taken a turn for the worse and the human rights situation has deteriorated. During the martial law period, the Supreme Court heard petitions for Habeas Corpus. It is most ironic, after martial law has allegedly been lifted, that the Supreme Court last April ruled it can no longer entertain petitions for Habeas Corpus for persons detained under a Presidential Commitment Order, which covers all so-called national security cases and which under present circumstances can cover almost anything. The country is far advanced in her times of trouble. Economic, social and political problems bedevil the Filipino. These problems may be surmounted if we are united. But we can be united only if all the rights and freedoms enjoyed before September 21, 1972 are fully restored. The Filipino asks for nothing more, but will surely accept nothing less, than all the rights and freedoms guaranteed by the 1935 Constitution — the most sacred legacies from the Founding Fathers. Yes, the Filipino is patient, but there is a limit to his patience. Must we wait until that patience snaps? The nation-wide rebellion is escalating and threatens to explode into a bloody revolution. There is a growing cadre of young Filipinos who have finally come to realize that freedom is never granted, it is taken. Must we relive the agonies and the blood-letting of the past that brought forth our Republic or can we sit down as brothers and sisters and discuss our differences with reason and goodwill? I have often wondered how many disputes could have been settled easily had the disputants only dared to define their terms…On one of the long corridors of Harvard University are carved in granite the words of Archibald Macleish: “How shall freedom be defended? By arms when it is attacked by arms; by truth when it is attacked by lies; by democratic faith when it is attacked by authoritarian dogma. Always, and in the final act, by determination and faith.” I return from exile and to an uncertain future with only determination and faith to offer — faith in our people and faith in God…” (Ninoy Aquino’s (undelivered) Arrival Speech). 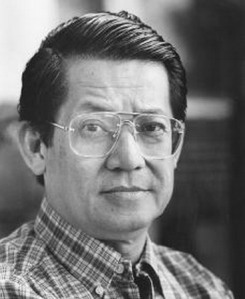 Benigno Simeon “Ninoy” Aquino, Jr. (November 27, 1932 – August 21, 1983) was a Philippine Senator, Governor of Tarlac, and an opposition leader against President Ferdinand Marcos. He was assassinated at the Manila International Airport (later renamed in his honor) upon returning home from exile in the United States. His death catapulted his widow, Corazon Aquino, to the limelight and subsequently to the presidency, replacing the 20-year Marcos presidency. In 2004, the anniversary of his death was proclaimed as a national holiday now known as Ninoy Aquino Day. Although Aquino was recognized as the most prominent and most dynamic opposition leader of his generation, in the years prior to martial law he was regarded by many as being a representative of the entrenched familial elite which to this day dominates Philippine politics. While atypically telegenic and uncommonly articulate, he had his share of detractors and was not known to be immune to ambitions and excesses of the ruling political class. However, during his seven years and seven months imprisoned as a political prisoner of Marcos, Aquino read the book Born Again by convicted Watergate conspirator Charles Colson and it inspired him to a religious awakening. As a result, the remainder of his personal and political life had a distinct spiritual sheen. He emerged as a contemporary counterpart of the great José Rizal, who was among the world’s earliest proponents of the use of non-violence to combat a repressive regime. Some remained skeptical of Aquino’s redirected spiritual focus, but it ultimately had an effect on his wife’s political career. While some may question the prominence given Aquino in Philippine history, it was his assassination that was pivotal to the downfall of a despotic ruler and the eventual restoration of democracy in the Philippines (Wikepedia).